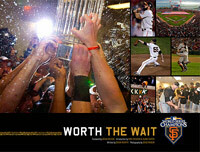 Written by KNBR's Brian Murphy and photographed by Brad Mangin, and with a Foreword by Brian Wilson and Introduction by Mike Krukow & Duane Kuiper, WORTH THE WAIT is packed with photos that transport Giants fans inside the action and behind the scenes, including on the team plane with the World Series champions and their coveted trophy on the jubilant flight home. Every player is here, and so are the fans in all their orange and black, Fear the Beard, and face-painted glory. Generations of friends and families will revel in the moments that made the 2010 season a truly once in a lifetime experience. Comments | [04/11/11] Terrific book that follows the SF Giants World Series season from start to finish. Well written, but Brad Mangin's photographs make this book a keeper.